42' Wide x 26' Long x 12' High Metal Barn with Raised Center Aisle and Boxed Eave Roof System (Better). With the many options that we offer, such as the huge selection of building dimensions, our three roof designs, 13 color choices, several end wall and side wall options, numerous garage door sizes, windows, and personnel doors, it is easy to personalize your metal barn to suit your application and to get the appearance that you want. Our metal barn packages can be totally open, partially encloses, or fully enclosed and can include garage doors, walk-in doors, and windows. We also offer insulation for the roof or for the entire building. Our metal garages and workshops can be installed ground, gravel, asphalt, or concrete. We have many more options from which to choose! 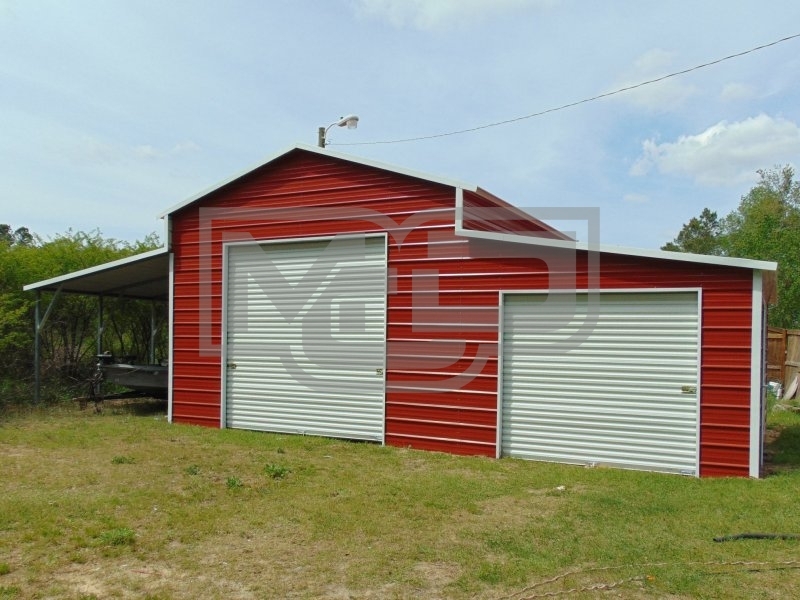 Our company works directly with numerous metal and steel barn manufacturers throughout the United States to provide you with a top quality unit that the best possible price. With more than 20 years of experience in the industry, our team knows the product, the manufacturer, and the area in which you live so well that we can provide you with the product that you need, at the best value, while providing remarkable service and customer satisfaction! With our outstanding quality, price, warranty, and options, it is easy to understand why we are a top choice for consumers! Metal Carports Direct is known for providing top quality carports, enclosed metal garages, steel buildings, and metal barns at the best value. Our mission is to provide our customers all of the information that they need to make the most informed buying decision possible. Our team will work with you to determine your exact need and provide you with various options so that you can choose the best one that works for you. That is the easy part! Once we have all of the information that we need to build your metal barn or steel barn, we will provide you with the exact cost of the unit, delivered and installed on your site. The only thing that we require is that you look over your order to ensure that we have every detail as you need it. If so, you will sign off on the order, pay a small down payment to get the order started, and we take care of the rest. It is really that easy! We look forward to serving you!